He likes coaching them, they like playing for him and we like watching them both. Currently, there is a sense of bliss at Manchester United that seemed so far away only a month ago that it begs the question whether it’s all gone full circle. 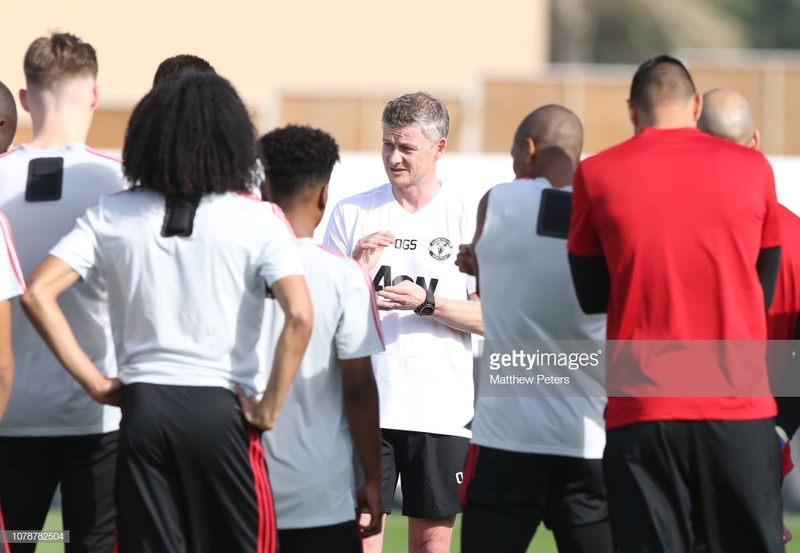 From the five opening wins of Ole Gunnar Solskjaer’s interim tenure to the photos coming from Dubai of a team at one with their coach this week, the honeymoon period is now coming to an end. Visiting Wembley to face title-chasing Tottenham Hotspur represents the first test of Solskjaer’s time in the dugout. The last month has seen an incredible upturn in not only United’s form but also the mood around the club. Helped by five relatively easy fixtures, which Solskjaer himself probably couldn’t have chosen any better, the emphatic yet friendly start has only strengthened the call for Solskjaer to be made permanent. Now it’s down to how he deals with the tougher tests to come. Sunday’s meeting with Spurs is when Solskjaer’s tenure gets serious. Inside Wembley, we will discover more about his credentials and his credibility as a potential full-time successor. Since his appointment there have been results to accompany the smiles and the positivity; the statistics are impressive too. Not only has there been five wins but also 16 goals scored and only three conceded and an average of 62 per cent possession. This is more than a new manager bounce; it appears that it’s more the Solskjaer bounce. The way in which he has unified the squad, reintegrated star player Paul Pogba in a more advanced position and provided the confidence and nous to allow Marcus Rashford and Anthony Martial to be more expressive and thrive up-front, has shown his ability. Solskjaer is naturally a good fit at Old Trafford – he always has been – and even more so than any of the three successors to Sir Alex Ferguson in the United dugout. He has the charm and the goodwill to make him successful in the long-term. Until this moment it’s worked, but now the true test starts. Whether the smiles, the unity and the positive playing style remain after a slip-up or a testing run is yet to be seen. There is no reason for this trip to face Spurs to end in Solskjaer’s first defeat as they travel there with confidence and rightly a belief that they can make it six from six. But with trips to Arsenal in the FA Cup and Leicester City in the Premier League as well as the return of Champions League football, the stakes are increasing with every match. It is now when the substance must begin to arrive with Solskjaer’s tenure. He has led remarkably since taking the reins in testing circumstances but has tended to shield himself behind quotes and remarks that every United supporter would want to hear – mainly because they feature the names of Ferguson or Sir Matt Busby. When the going gets tougher, as it definitely will, Solskjaer must prove that he is his own man; capable of delivering bad news and upsetting players is necessary. There must be grit along with the smiles and tough decisions will need to be dealt effectively. Discontent has arisen amongst the squad during the tough times, which have accounted for a fair amount of the time of late; this must be quelled when signs of it resurfacing show. It is thus quite fitting that Solskjaer comes up against one of the favourites in the running to become the next permanent manager at United in Mauricio Pochettino. There is no doubt that Pochettino has the proven quality and experience, but what favours Solskjaer is that he has the job at the moment, in many ways it is his to lose. There is much more beyond the manager’s role that United need to address. The hierarchy are already looking at the structure of the club; a Director of Football is required as soon as possible, a more convincing plan when it comes to bringing the best footballing talent to one of the biggest clubs and how to integrate the best younger players coming through the academy. In short, United need to take a look north east and to the operations of Manchester City. As is the case across all walks of modern day life, things tend to be exaggerated in football. It is often determined as black or white when in reality it is actually grey. United’s situation was dire, lacking enthusiasm and sustained quality but it was not the end of the world; as Solskjaer has shown – albeit only possibly temporarily – slight changes can be quite telling. The United picture is now seen in a much rosier light, with the future now something to look forward to rather than dread. The top four is only six points away, United remain in the FA Cup and Champions League with form on their side. If Solskjaer can steer United with the same positivity and success through the next few months as he has so far then his prospects of staying around will certainly be heightened. What is for certain is that it will only get tougher from here.